Matthew Sweet returns to the Big Finish main range for the first time since his quirky but brilliant ‘Year of the Pig.’ Managing to avoid many typical pitfalls of returning authors, Sweet somehow surpasses everything he achieved with his previous release, offering one of the absolute best releases in the ever-growing audio library. ‘The Magic Mousetrap’ is unafraid to challenge its audience, presenting a script that requires concentration while still managing to explain the unexpected events in a natural and unobtrusive manner. While the Doctor suffering from amnesia is certainly nothing new even within the confines of Big Finish itself, here the plot device is used incredibly effectively to help set up the intrigue, allowing listeners to discover events along with the Seventh Doctor rather than playing catch up with the companions as is so frequently the case. His lack of memory prior to his waking up on a cable car heading for a Swiss sanatorium in 1926 only serves to highlight the strange and off-kilter events surrounding him. Wisely, the script sticks primarily to the present, allowing the past to slowly be pieced together as events unfold. Intriguingly, Ludovic Comfort delivers electro-shock therapy treatments to his patients in order to deliberately keep their minds hazy and confused. Because of this confusion, the Doctor’s being perhaps the most important of all, a powerful mental construct is being maintained that keeps the mysterious villain of the story in check because nobody remembers or acknowledges him. He does eventually burst forth with an all-consuming insanity, but this purposeful delirium elevates the already-creepy atmosphere into something altogether more haunting. Supported by a truly excellent sound design and score as well as a script that excellently blends the dramatic and the humorous, the mundane and the bizarre, ‘The Magic Moustrap’ evokes its atmosphere and environment superbly. Sylvester McCoy gives one of his most arresting and brilliant performances as the Seventh Doctor for Big Finish, going from an initial over-the-top persona to a stunningly conniving one as his memories return and the final confrontation approaches. In a strong twist, it’s Ace and Hex who are the ones holding all of the cards, effortlessly blending in with those in the sanatorium while ensuring their pawn the Doctor continues to play his role properly. Both Sophie Aldred and Philip Olivier both seem to relish the opportunity to show their characters in control, and their shifting personas through the release are all utterly splendid. Of course, even bigger than the fantastic environment and performances is the return of the Celestial Toymaker, here played by Paul Antony-Barber in a truly desperate and terrifying turn. The revelation of his presence is genuinely shocking, but the end result is an appearance that far surpasses the much-loved original appearance in ‘The Celestial Toymaker.’ The Seventh Doctor’s penchant for games, strategy, and manipulation is the perfect complement for this foe, and the strategy of dividing the Toymaker’s power among his opponents as the Doctor challenges him to play multiple games at once is a clever and elegant concept upon which to build the story. 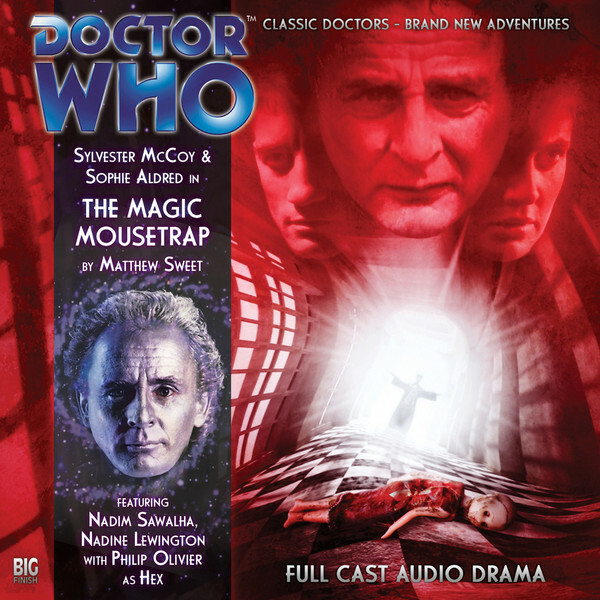 There have been several really good releases for Big Finish, but ‘The Magic Mousetrap’ is undoubtedly one of the few truly excellent ones, a masterpiece on every levels that showcases everything that is great about the Seventh Doctor’s era and the entire programme’s history.